Description: RC remote-sled CSX 9185 for controlling CSX 2738 ? Description: We see here the local switchers "Resting" in Plymouth Yard. Description: Q353 heads west with a C40-8W leading at 9:15AM. 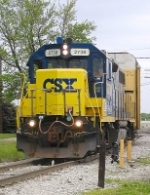 Description: CSX 2738 and 2707 wait for a crew in Rochester. This rare view is from the observation deck of Rochetster tower.